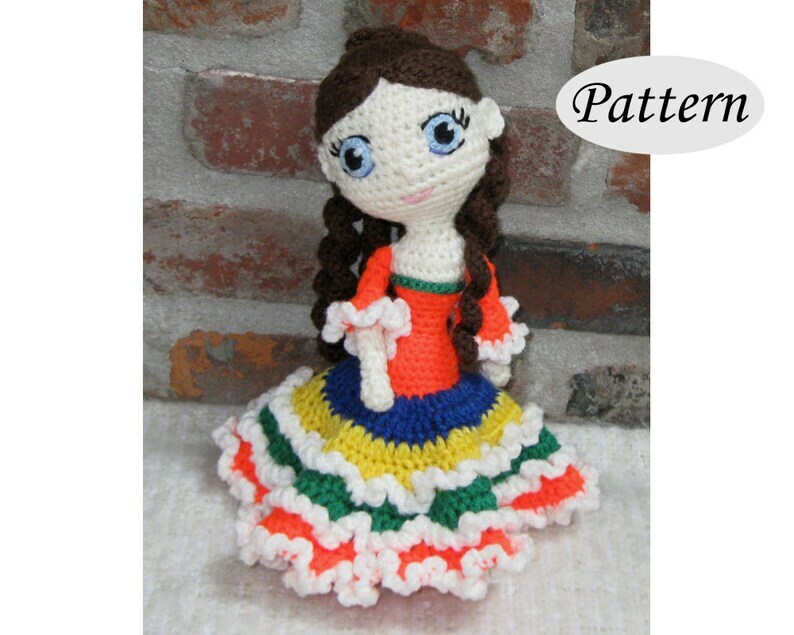 This is a crochet pattern for a beautiful and stunning princess doll. Amelie is a unique piece of craft. She has large, embroidered eyes and wears a gorgeous Victorian ballroom gown. The colorful dress has plenty of white ruffles. You will love the rich brown hair which has been styled in a regency hairstyle. Includes one PDF file, 28 pages. The pattern is written in English, using US crochet terminology for right-handed crocheters. It contains detailed instructions with over 100 step-by-step photos and useful tips. ~10” (26 cm) with worsted weight yarn (199g = 355yd/325m)and a F/3,75 mm crochet hook. Intermediate - you will need to know how to crochet stitches like single crochets and double crochets, starting with a magic circle, and increase and decrease techniques. You will learn how to shape the face, to embroider the eyes and to crochet and style the hair. There are lovely tiny details and the assembling and embellishment requires love, patience and time. I put a lot of patience into my patterns, but human mistakes are always possible. Please contact me if you have any questions. Copyright © 2015 Crochet Cute Dolls. You may NOT sell, distribute or change the pattern or any images contained inside the pattern or upload it to the internet. You MAY sell your finished doll provided you credit me as the designer (Pattern by Crochet Cute Dolls, Website: crochetcutedolls.com). If you want to purchase this pattern, please make sure that your Etsy / PayPal email addresses are valid. Please visit my website at crochetcutedolls.com. I loooooved this pattern. It's well explained and it's so easy to follow. I'd definitely buy another pattern from this store and I totally recomend it.